Jamie Whincup edged out Scott McLaughlin for the Race 4 ARMOR ALL Pole Award in a thrilling conclusion to a wet qualifying session at Symmons Plains. Torrential rain saw the start of the session delayed by 23 minutes as officials inspected standing water on the circuit. Once the 20 minute session finally commenced, it was all about circulating and trying to make the best of the conditions. Times tumbled in the final minutes, with McLaughlin displacing Whincup from the top before a final 58.397s effort from the Red Bull driver saw him 0.27s clear. It was a masterful performance from Whincup, who last night checked in on close friend Will Davison at Launceston General Hospital. 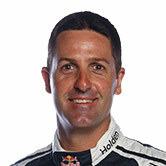 “It was crazy conditions, we were on the limit everywhere,” said Whincup of qualifying. “Davo knows what this pole money is all about. He normally drinks most of it anyway! “It’s critical to be up the front somewhere in the top five. We’re earning our money today. Chaz Mostert and Tim Slade share the second row ahead of Shane van Gisbergen, Fabian Coulthard, Todd Kelly, Craig Lowndes, David Reynolds and Cameron Waters. Lowndes moved to the top of the order inside the final five minutes but then slid off the road during the critical closing stages. A similar fate befell Dale Wood, who appeared set to shock the established stars before slipping wide at Turn 6 on his best lap. He will start 18th. Despite the tricky conditions that also saw the likes of McLaughlin and van Gisbergen taste the outfield, no cars took damage during the session. Rookie Alex Rullo however had a wild ride through the grass at Turn 5, triggering an early red flag when he came to rest in the gravel at the following corner. The 200km Race 4 is set to commence at 2:05pm local time.